Stuffed Baby Zucchini, Thyme for Cooking summer fun, gourmet starter. I used 2 small yellow squash for these, about 7" (18cm) long but only an inch (2.5cm) in diameter. No need to be precise. The ham helps hold the stuffing in place. Cut each squash in half the long way. Using the tip of a small spoon, scrape out the seeds and a bit of flesh, leaving about 1/4" (.5cm) all around. Divide and spread the onion, then tomato, basil and cheese into each of the halves. Cut the Prosciutto in half the long way. Wrap each half slice diagonally around a squash half, tucking the ends under the squash. Place on a baking sheet and bake, 400F (200C) for 25 minutes. To Serve: Cut cherry tomatoes in half. 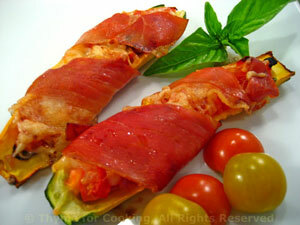 Remove Stuffed Zucchini, arrange on plates, garnish with tomatoes and serve.